Small Plastic Floss Keys. 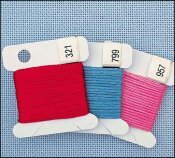 Pack of 25 Small Plastic Bobbins  - $2.50 : Yarn Tree, Your wholesale source for cross stitch supplies. Item 3275. Pack of 25 Small Plastic Floss Bobbin Keys. Each floss key has a tab that holds the floss number band. All you do is trim the band and slip it onto the floss holder. No more labels to stick on. No more numbers that you can’t read. The Floss Keys measure 1 5/8” tall by 1½” wide. Plastic is the most durable, but even our chipboard keys are strong—they are made from 10 ply chipboard (that’s 50% heavier than most other brands) and have a coating on both sides to help keep them clean. From Yarn Tree. Chipboard key is shown in photo. Also known as bobbins, bobins, floss holders, flossies, and floss winders. Made in the USA.